This selection of pens has been specifically selected to delight the discerning customer. These pens display an elegant design with superb balance, coupled with all the tradition of fine desk pens. These most elegant of pens offered with a rich 22k gold cap and barrel complemented with Rhodium plating. Rhodium is possibly natures most brilliant and durable precious metal. The fountain pen features a German made two-tone nib with an Iridium point whilst the rollerball features a ceramic tipped Schmidt cartridge to ensure smooth effortless writing. Finished pen measures 11/16″ diameter x 5.3/4″ long. These pens are a joy to use and would prove to be a truly remarkable present. The Peninsula Pens Titanic commemorative pen display has been hand made from the wood from Irish whiskey barrels. The desk pen stand has been made from the wooden bung. And until recently the only waste was the shavings generated when the wood is turned. Now Peninsula Pens has been advised that this by-product can be used in the smoking of fish and thereby adds a nice whiskey flavor to the fish when smoked. 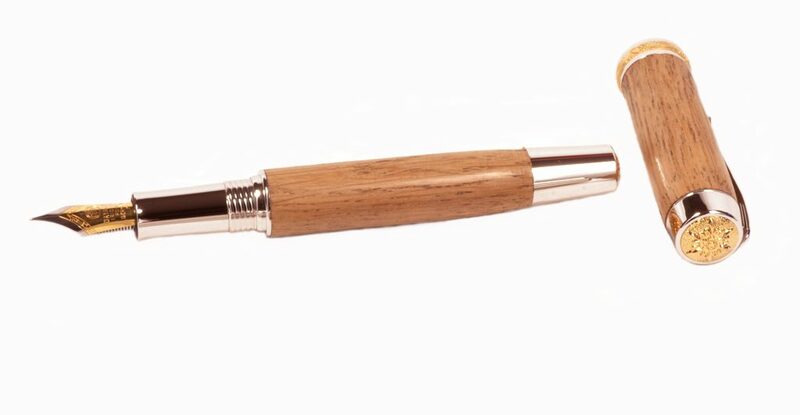 This discovery now means that the complete wooden barrel is fully recycled into a useful commodity thereby making our pens attractive to own but also eco friendly in their production. All pen styles can be made from a wide range of woods (pictures are with American white oak from whiskey barrels) pens can be Lasered with personal chosen text i.e. Anniversary, Retirement, Birthday etc. for an additional charge of £5:00. Please choose the personal message option.